Bravura Gold Resort Presents CRICKET MANIA (23rd March to 5th May, 2019). 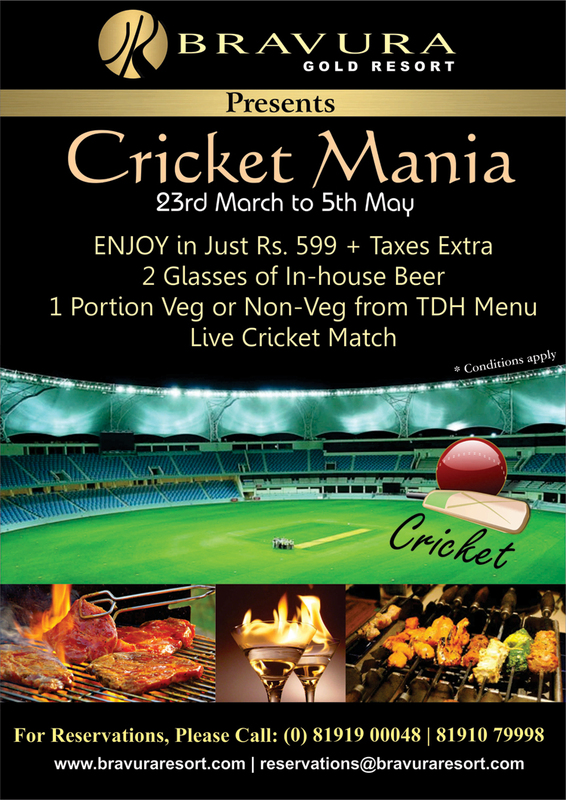 Enjoy 2 Glasses of In-House Beer, 1 Portion Veg or Non-Veg from TDH Menu and Live Cricket Match in Just Rs. 599 (Taxes Extra), also Get 20% Discount at Bottles ‘n’ Barrels (New Exclusive Pub). The matches will be telecasted live on a Big Screen. Don’t miss this wonderful offer during the entire match hours. Come and cheer up the team and have fun.